Heads up, Teen Titans! There's a new hero in town, and while Damian might not want to join you, he's more than happy to lead you! 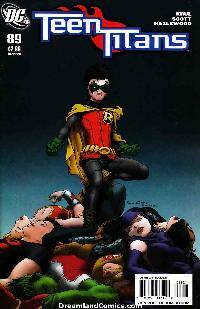 There should always be a Robin on the team, but if Damian is their only available option, maybe they'll pass on having a Boy Wonder. Hopefully he'll be able to help against the terrible menace of the rising villain, Headcase!